Have you or someone you know ever fancied finding out more about hands on animal care by having a hands on experience with a dedicated and professional animal care team? Well now you can! Holly Hedge Animal Sanctuary is offering an Animal Carer for the Day experience which is perfect for anyone who would like an insight into how the animals are cared for at Holly Hedge. The experience will make you feel like a real part of the team! Whilst shadowing one of their dedicated and experienced staff you will learn new skills and have a greater understanding of the work and care involved to look after the wonderful canine and feline residents. 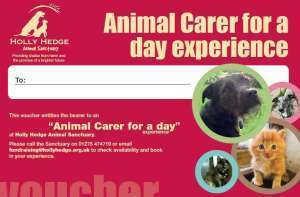 You will have the opportunity to get involved in various parts of the animal carers day, including cat cuddling, dog walking, preparing food, feeding and mucking out. You can take part on various dates throughout the year and our Carer for a Day experiences include a guided tour of the Sanctuary, a goody bag, £5 gift shop voucher and a certificate to take home and cherish forever! The experience is perfect as a gift for a friend or loved one and if you wish to purchase the experience as a gift we will send you a gift voucher with a personalised message. Please note, for children under 16, they must be accompanied by a supervising adult. Being an Animal Carer for a Day costs £65. To purchase this wonderful experience please email fundraising@hollyhedge.org.uk.